This highly-respected copywriting formula created by direct marketing pioneer Bob Stone remains an enduring tool even decades later. Its specific focus is on the benefits of your cause, project, program, product, or service. 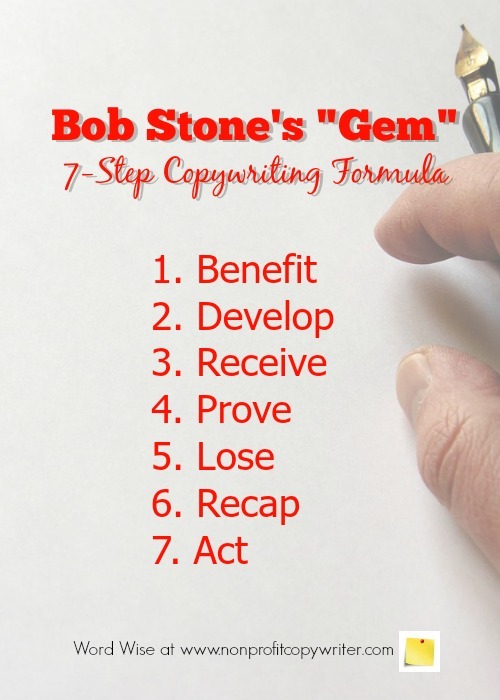 Stone’s 7-step formula was originally meant for sales letters and direct response advertising. Yet copywriters everywhere have learned that “Bob Stone’s Gem” (as it is fondly called by marketing professionals) is useful in nearly any kind of promotion. Try it in your appeal letters, blog posts, articles, or other promotional materials. It works. Begin with your strongest benefit – either in the headline or first paragraph. Expand on the most important benefit. Tell the reader specifically what he will get, using all details, features, and benefits. Demonstrate how those benefits are true and valuable by providing proof, facts, evidence, and endorsement. Tell the reader what he will lose and what benefits he’ll miss out on if he doesn’t act. Sum up the most important benefits. Give a call to action. Tell the reader to respond immediately and give him a good, logical reason why they should. Show how the benefits will kick in. The formula is valuable for several reasons. Simplicity. It’s easy to follow. Versatility. It's adaptable. You can use it in all kinds of appeals, whether in print or online, appeal or sales letter, short or long piece. Logical. It gives you a sequential outline to follow. The steps proceed logically. Benefit-oriented. Most of all, the formula allows you to focus on the benefits of your cause, program, or specific campaign. If you follow the formula, chances are you’ll end up with a very effective appeal letter or promotion. Try it!